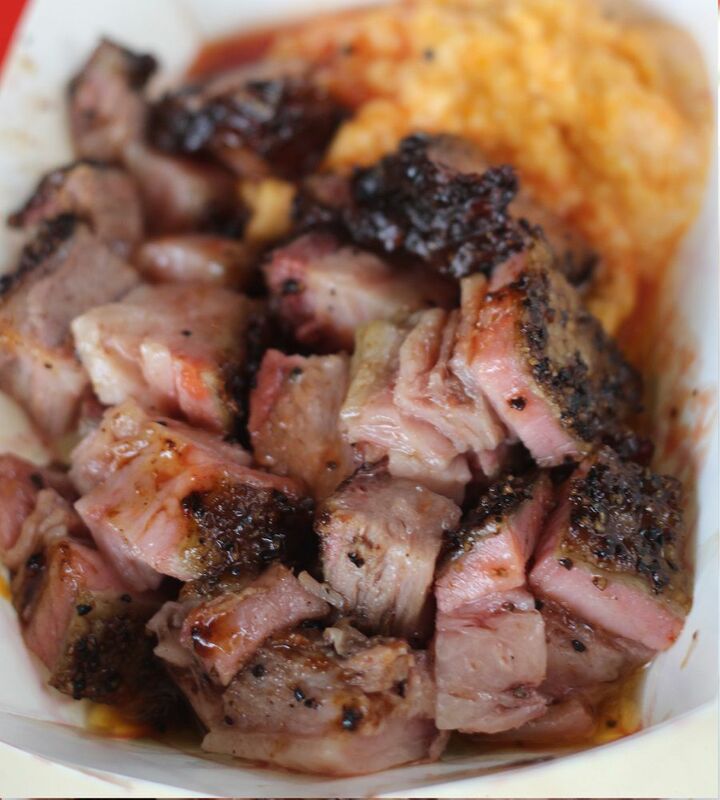 In Texas, the title of pit master is a revered and honored position. Many joints will not officially allow use of the name until the experience and efforts of a contestant prove they have the skills, passion, and consistency that it takes to earn the designation. 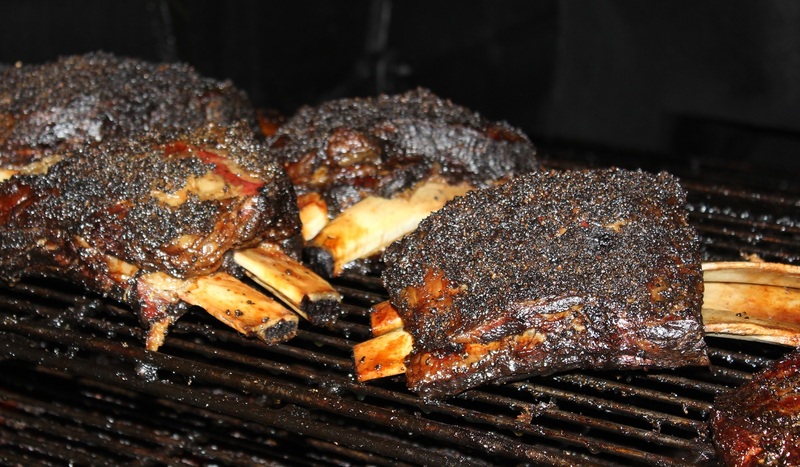 In this series we look at the next generation of pit masters; those under the age of 30. 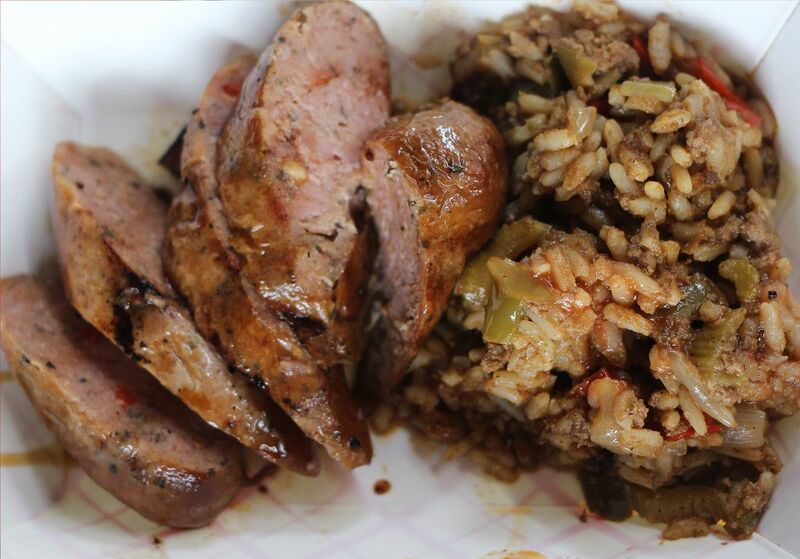 For this article, Patrick Feges (rhymes with “Regis”) of Feges Barbecue and Killen’s Barbecue is featured. Just over 10 years ago Patrick Feges lay on an operating table in Ramadi, Iraq. Shrapnel from a mortar shell tore through his abdomen, his intestines, and severed his iliac artery. During the life saving operation Feges received 32 units of blood. The average human body contains 10-13 units total. His heart stopped two times before the operation was complete. All of this occurred the day before his 20th birthday. 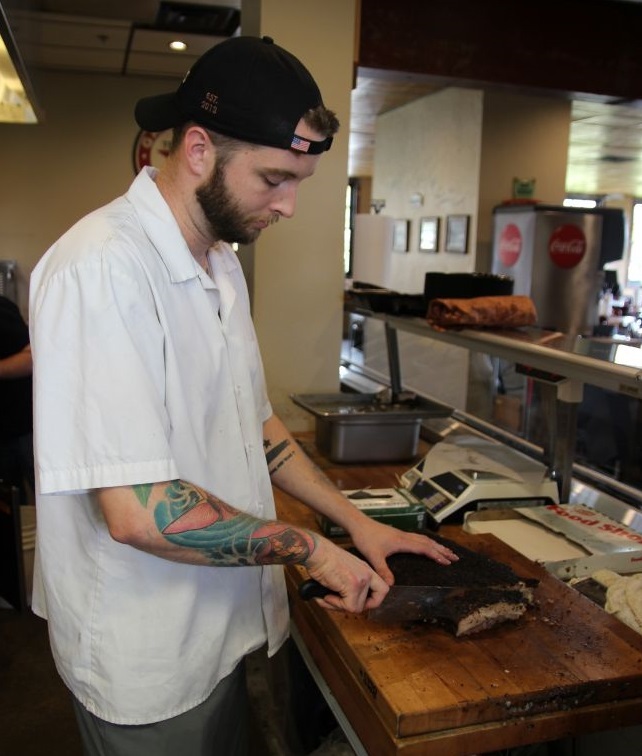 Since then, Feges has built an impressive culinary resume and is currently at Killen’s Barbecue in Pearland, Texas. Under the tutelage of Ronnie Killen, Feges is learning the ins and outs of daily operations while working in a variety of roles. Feges is a Sugar Land native and displays his Houston pride with a large skyline tattoo on his forearm. Feges just recently turned 30 qualifying him for this special Veteran’s Day edition of Young Guns of Barbecue. Bryan: You were born and raised in Houston? Patrick Feges: Born and raised in Sugar Land. I live in Houston now. I still have family in Sugar Land, but I’m never moving back to Sugar Land unless kids dictate it. It is a great place to grow up, a great place to raise a family. But when you are where I am now Houston just has so much more going on. Bryan: How did you come to cooking barbecue? 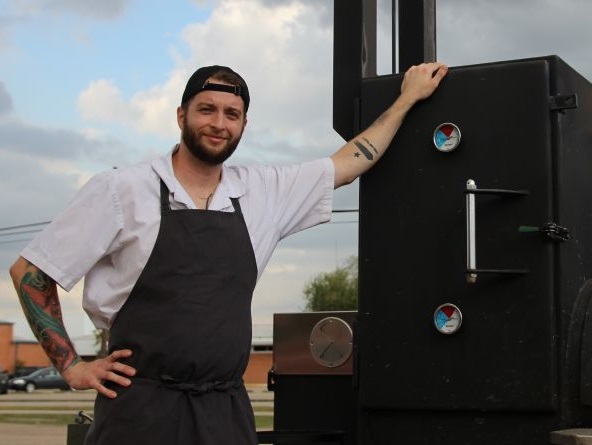 Patrick Feges: Brisket has always been one of my favorite things to eat, that smell of that smoke… that Oak smoke. I just got hooked. I like to do things the hard way so I figured I’d do it myself. When I was leaving the army, being medically discharged in Fort Sam Houston, there was a guy doing the same thing and he left me his old beat up Brinkman smoker. I took it home and started playing around with it. That’s how I got into smoking meat. I didn’t get bit by the barbecue bug, it was something I would do because I liked eating it. Those briskets were terrible. I had no clue what I was doing, I was just doing it on my own. No one taught me how to do it, it was just trial and error. I went to The Texas Culinary Academy (an affiliate of Le Cordon Bleu) in Austin and the school threw a barbecue cook off fundraiser. I was on a team and we placed in the top three in all three categories. After that I was like, “this is pretty good.” I started going out and eating at barbecue places in the Austin area that I didn’t know existed before then, eating good barbecue you know, not barbecue you found in Sugar Land. Bryan: Do you remember any that stood out? Patrick Feges: I remember Cooper’s in Llano was one of the first ones, Blacks, Rudy’s. I lived five minutes from Rudy’s. I worked next door to a Rudy’s at one point so I ate there quite a bit. For what it’s worth Rudy’s is pretty good, it’s better than the barbecue I grew up on. Black’s, Kreuz’s. I wish I would have went to Snow’s before it was discovered. I’ve read about it but I’ve never gotten a chance to get out there. I like those old school places, like Black’s, if you beat the church crowd there’s no one in line, and they’re open. It’s not like your waiting for them to open. I’ve gone into Kreuz with just a handful of people in front of me at like two in the afternoon. Those places don’t garner the line like some of the others do. Bryan: They’re also open throughout the day, serving continuously. Speaking with those restaurants that are open through dinner, they’ve said it’s difficult to manage. Patrick Feges: It would be hard, dealing with the spacing on the pits. Also the staffing. Even if you have a second set of pits for dinner, you’d need a whole other crew because while you’re serving dinner you’d have another crew prepping the meat for the next days lunch. You’d need a whole other crew. We’ve already got an army of people back there. After leaving the army I took a year off to figure out what I wanted to do. I was going to be a teacher and worked an after school program. Then I got into cooking; I wanted to go to culinary school. Patrick Feges: No, I did. I started straight off the bat with brisket. It took me a couple tries to figure it out, then I started putting out some decent brisket and playing around with it more. I backed off for a little bit, I was tinkering with it a little too much. Bryan: No pumpkin spice rubs I hope? Patrick Feges: (laughs) No, not yet. When I first heard about using just salt and pepper on a brisket it kind of hit me, that’s what you season steak with. Brisket’s just a giant steak, so why not. Then I read about the old school places like Kreuz and Black’s have been doing it for a hundred years. If you can last a hundred years just seasoning with salt and pepper you’ve got to be doing something right. I add stuff to my pork rub, but with beef if you do that it covers the taste of the beef. Different animals require different things. Just like a crappier cut of meat requires more work. Bryan: After you got out of school, where did you start? 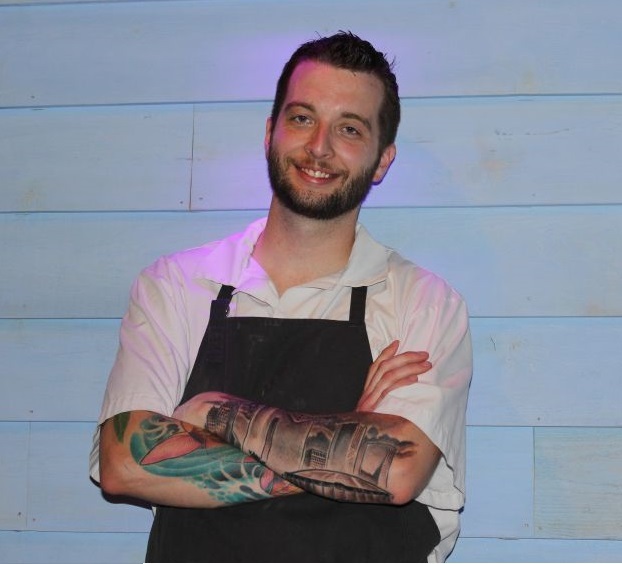 Patrick Feges: I started out at Kona Grill in Sugar Land. I guess I wasn’t ready to leave Sugar Land yet. When Brennan’s reopened I managed to get a job there. I was working for Compass Group in downtown at the time and I drove past Brennan’s every day on the way home. I watched them rebuild that place and I thought “I’d really want to work there”. I saw they were hiring so I applied there. I left Brennan’s when Underbelly opened. Chris Sheperd gave me a tour of Underbelly one night. I had gone to Hay Merchant to get some drinks and Chris gave me a tour when they were just getting ready to finish it up. I had to work there. I came back the next day and begged him for a job. It was a great job. It was the perfect restaurant for me. If I didn’t want to do barbecue I would be there forever. Bryan: What was it about Underbelly? 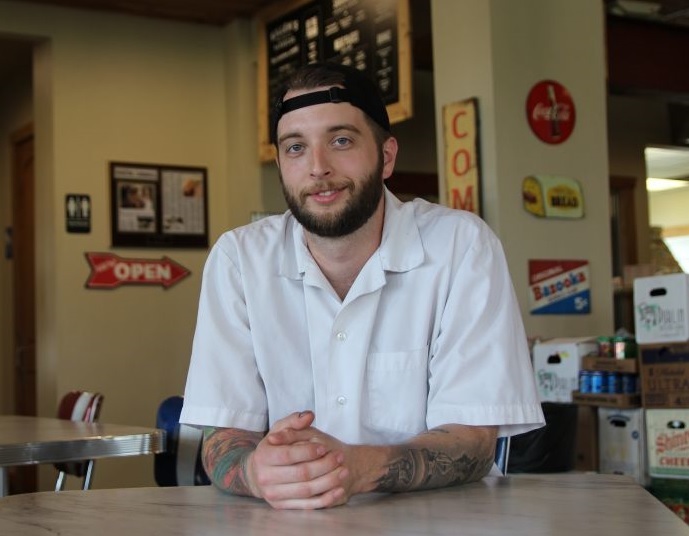 Patrick Feges: You could do anything you want because it’s Houston food. You’re not limited to a set cuisine because Houston is so diverse. You could do any food you want. I was smoking beef ribs there at one point. I got to do my barbecue influence there. They still do it. Every time I go to Hay Merchant I can still smell that smoker going. I convinced Chris to bring his smoker from the house, so they smoke a ton of stuff there. When I started there I was real big into asian food, well I still am. When I was there I got to cook a lot of asian food. With Chris he expects you to put food on the menu. He makes you a chef. Its unlimited; whatever you want. They are getting whole cow so if you want some crazy cut of beef, you can get some crazy cut of beef as long as the restaurant can make money off of it. The produce you get is top notch. Everything there is the best ingredients you get. You learn to appreciate your food more. You develop relationships with the suppliers, the people who raise the cows, the people who catch the fish and shrimp, the people that grow the vegetables. They are showing up right from their farm, coming straight to you. You appreciate more where your food comes from. There’s a great team there; Chris is great, he’s got a James Beard award. Lyle (Bento) is opening his own restaurant now (Southern Goods). It’s that opening team. I just saw that Daniela (Soto-Innes) is at a restaurant in New York now. (You can read more here.) JD (Woodward) ran Goro and Gun for awhile. It’s a whole bunch a really good chefs. Dax (McAnear), just very talented people that you were working near to. I learned a lot. Bryan: Did you pick up a little bit of influence from each? Patrick Feges: Definately. You’re bouncing stuff of of each other, everyone helps each other out as far as plating and how to do something. Everyone taught someone something. When you’re with Chris you’re family; it became a family. It was a great experience. Bryan: What would you say that you’ve taken from there and brought in to barbecue? Patrick Feges: Ronnie reinforces freshness. Working with the best ingredients. Let’s put it this way, when you’re cooking barbecue at home you’re limited in the grade of brisket you can get from the store. All I had ever cooked before was Select. If you can make a good Select brisket then you can make an even better Choice. Just knowing that working with the best stuff kind of gets you ahead in the game. How you treat people; customers, employees, purveyors. Everyone loves Chris but there’s a reason why they love him, because he’s a great guy. He’s not hard on people. When you screw up he’s not yelling at you. He’s disappointed, like a father figure. That’s not where I came from, you know, I was in the military. When you screw up they let you know you screwed up. That’s how I was and Chris tried to steer me away from that. But he’s not going to let you slack off. He’s not going to create the dish for you. “I want this on the dish. Make it like this”, but it’s up to you to figure it out. Bryan: Barbecue is a little more constricted than that. Patrick Feges: Yeah, we’re not doing composed plates. Bryan: How did Ronnie Killen hire you away from Underbelly? Bryan: So that was part of the decision, to learn the business side also? Patrick Feges: Yeah, at the end of the day that’s going to make it easier once I do get to that point. I wanted to do this years ago, when I was single and could move to Austin to work at those joints there but I never pulled the trigger because I wasn’t ready to get out of the kitchen. I wasn’t ready to stop cooking food. Bryan: Is Ronnie a good mentor? Patrick Feges: Yeah, Ronnie’s great. I’m learning the good things and the bad. Ronnie’s trying to get a pavilion built and I’m watching him go through that with the city, the permits and all that. I wish I could have been here from the get-go to see how he built this place. He’s talked to me about the process he’s gone through. The meats; which purveyor is better. Who has better brisket. Patrick Feges: Yeah we had ribs but were constantly trying to get better. We’re always looking to improve. Today I had to talk to one of the meat guys. The plant we were getting them from wasn’t up to standards. So they said they’d work something out. They just called me today and said they found a smaller packing plant that can probably do what we want to do. They’ll bring us a sample and we’ll try it out and see what we think.With briskets you get different sizes. Some with more fat, some with less. I talked with Wayne Mueller’s right hand man a couple years ago and he said “look man, you’ve got to be able to cook an 8 pound and an 18 pound brisket. You got to be able to do it all.” It makes sense. Patrick Feges: We put most of them on at the same time but the ones that are done sooner we pull off and those are the ones we serve first. It kind of helps because we don’t have to pull them all off at once and put them in the warmer. That’s why I like the different sizes, so at two o’clock you might get a brisket that is just as fresh as you would have gotten at eleven o’clock. If they’re all the same size then the one at two o’clock might have been sitting out. 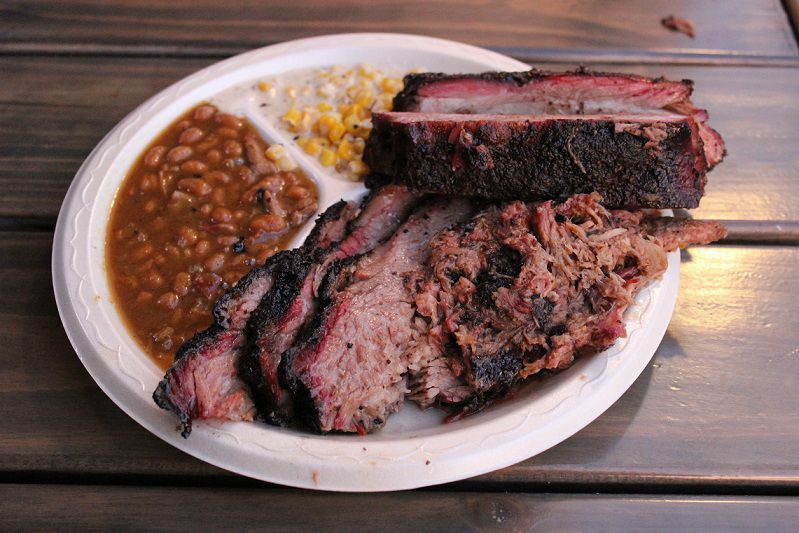 Bryan: Is Feges Barbecue your long term vision? Patrick Feges: Yeah. Somewhere here in Houston, preferably inside the loop but who knows. Houston is so expensive now. Sometimes I worry the price of building is going to push me out of the loop, maybe in the suburbs. If that’s the case, opening a place in Sugar Land isn’t that bad. My mom’s trying to get me to move back to the house we grew up in. Whenever, wherever the opportunity is, if it’s right you’ve got to take it. Whenever and wherever that might be. I’d love to get something going next year. Bryan: As long as beef prices don’t keep rising. With a larger restaurant there may be other things that can help offset those prices, but it must really squeeze the small operations. Patrick Feges: Yeah, if there’s another drought we’re screwed, but that’s been my dream for a long time. I enjoy cooking and working the kitchens but I think I would be more successful and happier doing barbecue than I would be opening a restaurant doing other food. The barbecue business may be tough and the margins may be small but being young and doing it on your own helps. Maybe I open a different restaurant down the road but do barbecue first, that’s what Ronnie did. Maybe open a barbecue restaurant and if that’s successful for a while open up an icehouse and do some fun food, cook whatever I want to cook. Or, I could open up a barbecue joint for lunch only and have an empty restaurant at night and then I could do other food out of that at night. I can see the opportunity to do other food if I want to. Bryan: You did a few creative things when you had your pop-up back in June with Wes Jurena (from Pappa Charlie’s). The beef belly with watermelon sauce and pimento cheese grits for example. Patrick Feges: I miss that. I love doing barbecue but I still miss making composed plates so that was a way to kind of do both. I don’t know if you want to call it new-age barbecue, barbecue fusion, or whatever the hell you want to call it but it’s a way to incorporate barbecue style into other different food. Pork belly and grits is always something that goes good together so change it up to beef belly. Bryan: The watermelon sauce was different, too. It’s interesting to see traditional barbecue sauce changed up. Patrick Feges: Anyone can make a vinegar sauce or tomato sauce. I’ve always enjoyed making sauce where I’ve worked; that’s kind of my thing. At Underbelly I really got into making barbecue sauces. We had a canning program. What I would do is take peaches that weren’t going to last much longer and make a peach barbecue sauce. A farmer gave us three cases of over-ripe figs that were too ugly to put on the plate but still tasted fine. So let’s make a fig barbecue sauce. At one point I even made heirloom ketchup because we had so many heirloom tomatoes we couldn’t get rid of them fast enough. You kind of start out with that. I just think, you know, I’ve got a sweet tooth so I came up with the watermelon sauce. It worked out. Bryan: There are some others out there on the edges. Valentina’s Tex-Mex and Goldis Sausage in Austin for example. They still have that core of meat and smoke but it’s a little different. Patrick Feges: A little bit of flash on there. It makes someone think “where has this been”. Patrick Feges: That was an easier way to do turducken. I don’t want to call it lazy because it’s not lazy. It’s so hard to make a turducken and slice it to make it look good on a plate. Every Thanksgiving I have to do a smoked turducken because I did one five years ago, and now I have to every year. Usually with the family we just tear into it; we’re not slicing it for show. For sausage just grind it all up and stuff it in a sausage. Serve it with some dirty rice and cane syrup. The syrup is sweet kind of like a barbecue sauce. It’s just cane juice reduced down but it’s sweet and so complex in flavor. It’s one of my favorite ingredients. I put that stuff on everything. The sausage idea came out of necessity. How am I going to cook a turducken, transport it, hold it at temperature, and slice it? The sausage was an easier way to do it. Patrick Feges: Its so busy here. Ronnie’s great and he wants me to keep doing these things. He’s never said no to me doing a popup or anything but it was eating up so much time, doing it every week I think was a mistake. Trying to spend time here, trying to spend time with the girlfriend, and trying to do that there was no time for anything else. It was something the bar asked me to do. It fit the theme of the bar, so we gave it a shot. People loved it but I needed that time. I did a smoked turducken for the Lucky Dog event October twenty sixth. It was cool because the other chefs were from the northern part of the country and they didn’t know what a turducken was. The whole kitchen smelled like smoke. I’ve got a dinner coming up with Erin (Smith) and Bobby Matos who I used to work for at Brennan’s. It’ll be smoke themed, but it’ll be plated. I’ve got some people asking me to do some catering for the holidays. Every year I also make a bunch of turduckens and sell them, but I’m not doing that this year. Right now I’m just trying to focus on this, and Erin. (Erin Smith is Patrick’s girlfriend and the Executive Chef at the downtown JW Marriott.) When she gets settled in at her job then I can figure out what my next step is. That’s kind of the plan we made, she’ll open the hotel and get settled in and then we can go from there. Bryan: What do you see happening in the Houston barbecue scene? It seems like its beginning to really take off. Patrick Feges: You’ve got some good restaurants and some great restaurants, but right now the amount of great restaurants is unbelievable compared to a few years ago. It’s the same way with barbecue. Maybe all these places opening up are out of necessity with people tired of driving to Austin. 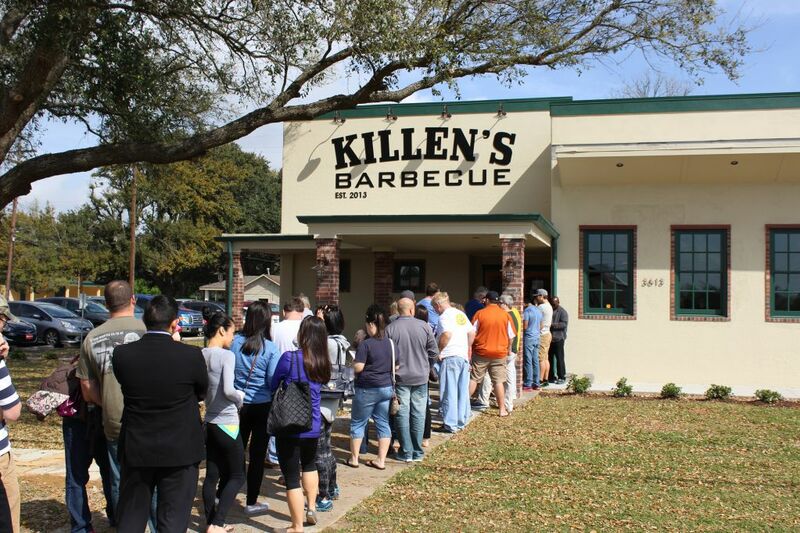 Weekend line for Killen’s Barbecue at 11am.